“And then shall many be offended, and shall betray one another, and shall hate one another”. 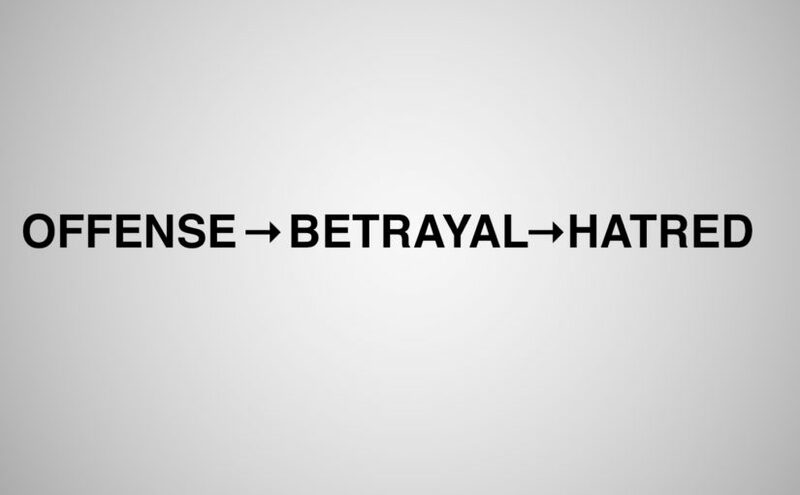 I don’t know that it’s as linear as A leads to B leads to C… or even A + B = C. But when I think of my own circumstances of being offended or being the offender… I can quickly see the path leading to betrayal and hatred. In a time where there is great division as a church, as a nation, as a world, and on SO MANY DIFFERENT TOPICS, offense sure has a lot of places to hide and take root. I love healthy dialogue, talking through hard issues, listening to a position different than my own. But we all know that those conversations can quickly escalate and go south. Offended is described as resentful or annoyed, typically as the result of a perceived insult. I don’t think there’s a question about the bigger, black and white offenses that occur. God doesn’t call us to be doormats. Persecution for sake of the kingdom – YES… Doormat… NO. I believe we are called to use our voice when we can, especially for the kingdom’s sake. To protect the weaker. To stand for truth. But it’s in those smaller things, it seems to get a little grey. And also in those smaller things that bitterness and discord can take root in the body of Christ. I wonder if this is exactly what Jesus is warning about – destruction will come from offenses, betrayal, and hatred. And let’s face it – we’ve all offended someone and we’ve all been offended. I need wisdom and guidance from the Holy Spirit to know when I need to just move on from an offense and rely solely on the Lord to heal my heart… and when I need to have a conversation, set healthy boundaries or share my truth. There are relationship we care deeply about and don’t want an offense to continue and cause more damage. Some questions I’ve been asking the Lord to reveal to me – Where have I allowed offenses to take up space in my heart? And am I more offended when people sin against God or against me? Am I aware of the ways I offend others? For a small example… when I learn that a friend has said something hurtful about me, gossiped, or made inaccurate statements, do I address it as an offense or let it go? And by let it go, I mean pray like crazy to not hold a grudge, but often it still creates distance and the relationship feels strained. It can take time for the heart to heal. Personally, I’d prefer someone come to me if I’ve hurt them, even with a small offense. I’d like the opportunity to learn from it and make it right. I’ve talked to other people on this topic that do not want conversations about small offenses…it’s exhausting and there’s an unspoken level of grace and forgiveness among friends. Not to mention, resolution doesn’t always occur. Take a really minuscule offense, for example’s sake, of going to the DMV to renew your driver’s license. You know the drill. Line A so you can get in the right line for what you’re there for. Line B to show you have a license, prove you live at the same place, etc. Line C to get your photo taken. Then you wait for your number to be called for Line D, to actually get your license. You’re SO CLOSE and then the employee at Line D tells you that you can’t renew your license because you have an unpaid traffic violation from 2000. Yes, EIGHTEEN YEARS AGO. Sure, the “said person” has renewed their license several times since 2000 and can’t recall the ticket, let alone not paying it. The DMV has no info on the ticket, only that it was only reported to the DMV in 2015 and the state lost a lot of records for 15 years and then suddenly caught up. The ticket has to be paid in the county it was issued (an hour away). In this scenario, do you just leave with kindness and a smile and give them the ol’ Chik-Fil-A “it was my pleasure to spend 45 minutes with you today”. Or, do you (in the least snarky way possible) ask if this could have been figured out in Line A or even Line B and saved everyone’s time? I mean, really? Why do I feel the need to go all Six Sigma on the DMV? What value or gain is there? I mean, this “said person” – whoever they are 😉 are they really going to change the DMV? While this is just a small and humorous example, it plays out the same way in bigger things. Somewhere rooted inside of me is this spirit of truth, record setting and harmony. 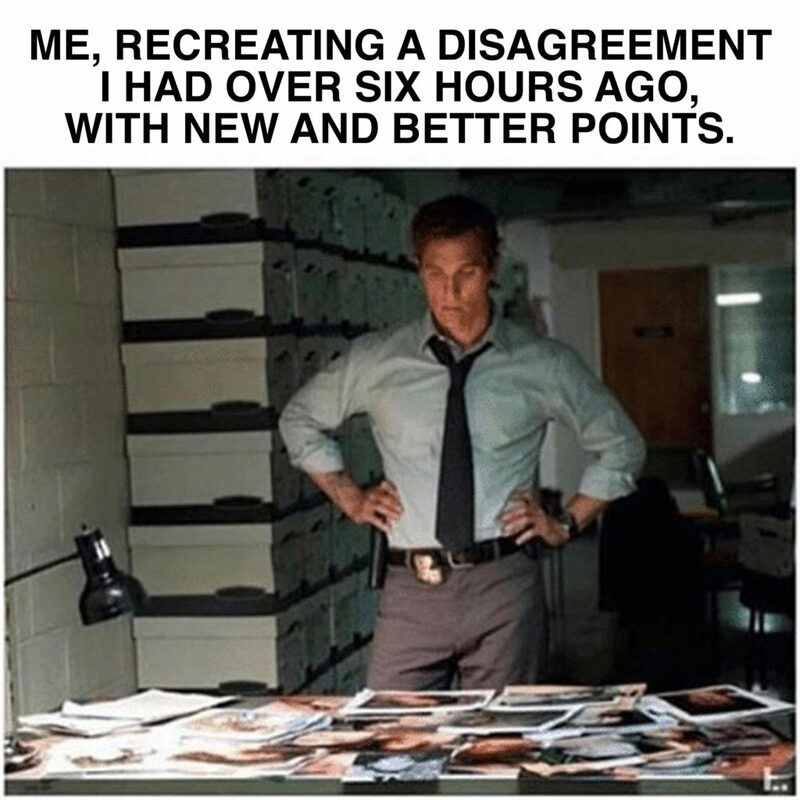 It all sounds good, until it turns into a spirit of self-righteousness, obsessing over the facts, or carrying around the heaviness of my own offenses to others. I’m in a season of prayer, asking God for peace over both sides of offenses (offender and offended). To take away the weight of my offenses to others that I’ve sought forgiveness for. And to show me the difference between addressing offenses that will bring good, and when to LET. IT. GO. This meme captures the humor of my brain at times. Lord, thank you for forgiving me of my offenses against You and Your children. Thank you for walking with me when I’ve sought forgiveness of those I’ve offended. God, I need your healing from hurts I’ve felt. Please show me when and how to address offenses that need to be addressed. Please protect my heart from any root of bitterness, betrayals, or hatred. Fill my heart with gratitude for your grace and leave no room for an offendable spirit. Amen.